Once upon a time, lost amongst the ancient mists of prehistory (the 1980s), the idea of a PC built explicitly for gaming was ludicrous; PCs were work and education oriented, and marketed as such. Even as PC gaming became more popularly accepted - and more lucrative - PCs manufacturers that specialized in gaming specs were extremely rare. It was mostly just Alienware with a handful of specialized, individual models on the fringes of the larger companies’ catalogs. In this glorious modernity, gamers looking for a specialized PC to service their hobby are spoiled by a multitude of options, a brightly lit, liquid-cooled array of powerful hardware screaming for attention under the banner of increasingly hyperbolic names. While learning how to build a gaming PC might save you a few bucks, not everyone has the technical inclination or the spare time to go about hunting down individual parts and then carefully assembling them (though if you are in the build it yourself crowd, have a look at our best CPUs for PC gaming, best cases for PC gaming, or best graphics cards for PC gaming for some handy tips). For those who prioritize time over money, a pre-built gaming monster is mighty attraction, but in an ever-expanding field, where do you begin? The first major decision you face when buying a gaming PC is form factor. Are you looking for a laptop you can carry with you to school or work, something to play around with on the train or in the comfy confines of your own bed? Or do you want a proper, beefy desktop, a powerful machine that can easily handle the best PC games on the highest settings, to output to your fancy 144hz gaming monitor? If you want to go desktop, here are the best gaming PCs to consider. In terms of performance, a laptop will always cost you more than a desktop - you pay a premium for portability. On the other hand, some laptops come with perks that are comparatively rare in desktop setups, things like a touchscreen precision trackpad. Think about what setting you’ll be using your new PC in most and plan accordingly. If you’re already invested in a sweet gaming chair, high end display, and surround sound, or spend most of your time gaming at home, a desktop is probably for you. On the other hand, if you travel a lot or like to game while something streams on TV in the background, a laptop may be the better choice. If you want to go portable, here are the best gaming laptops to consider. After you’ve settled the laptop vs. desktop issue, your next priority should be budget. Figure out how much you can reasonably spend, and how much power you’ll actually need. If you’re just looking for a PC to match current console specs, you can easily get by under the $1,000 mark (if you really need to tighten down, you can even make do closer to the $500 threshold if you bargain hunt and spend wisely). On the other hand, if you’re looking for an absolute beast to stupify those console newbs, you can easily spend in excess of $4,000 and ensure that not only will you have a blazing fast machine to annihilate anything the games of today can throw its way, you’ll also be ready to handle all the most demanding games for years to come. Consider your priorities when pricing out a PC. If you don’t mind some lower settings or find you can’t tell the difference between FXAA and MSAA anti-aliasing, you might not need to spend a thousand dollars extra for a machine with a Titan graphics card. Because of the way game’s graphics are somewhat leashed to console generations, even much older PC hardware will be able to play games reasonably well until at least we get another major console iteration. That said, if you can afford to splurge now, you might actually end up saving yourself some cash in the future. And don't forget that you'll need the extras: like grabbing one of the best gaming monitors, or saving for a PC headset for gaming. Future proofing is an important consideration, because while skimping now might save you some bucks in the short term, if you find you have to buy a brand new system in six months or a year anyway, your long term savings might be negligible. Consider how much you’ll need to upgrade when factoring out the total cost of your machine, and bear current hardware trends in mind. If there’s a new round of graphics cards or processors looming large on the horizon, being patience until they launch might net you significant savings on builds that feature the hardware they’re replacing. Another thing to consider when you’re contemplating your hardware’s future is expandability. Regardless of what price point you decide on, you should try to find a machine that has some overhead for future upgrades. That way, instead of replacing your entire system within a year or two, you can just swap in some new parts at a fraction of the price. If you don’t mind some mild tinkering (something that parts manufacturers are making easier all the time), you can save yourself thousands of dollars across the life of your PC by gradually upgrading individual components. Our guides to things like the best gaming mouse and the best gaming keyboard can help to save you cash now on items that you can upgrade later. If you’re looking for some quick advice, Alienware’s Aurora is an excellent, versatile gaming desktop. The Aurora has the advantage of being eminently customizable, so you can modify your order to suit your precise needs and budget without having to personally fuss with any actual parts swapping. Regardless of which build you decide on, you’re getting an attractive, thoughtfully built PC at close to the price of the individual parts, complete with one of Alienware’s distinct cases and flashy RGB lighting. 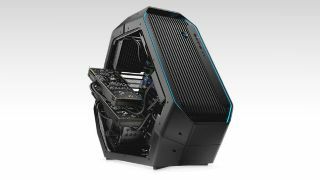 For a complete analysis of their current line, check out our guide to Alienware gaming PCs. If it’s a laptop you’re looking for, personally, I’d recommend MSI GT75 Titan if you’re a power gamer who prioritized mobility. The Titan is a big, extremely powerful laptop that will devour even the most intense games, and comes packed with extra features, like a G-sync display and a 512GB solid state drive. It’s a beast that can keep pace with many desktop machines and, while pricy, will be the only gaming PC you’ll need for years to come. If you prefer Razer for your gaming laptop needs, on the other hand, take a peek at our complete guide to Razer gaming laptops.